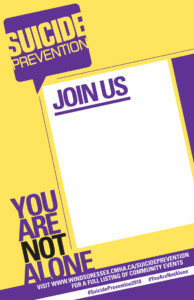 Join us to raise awareness of suicide prevention in our community! 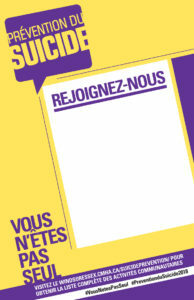 This promo kit provides you with resources to help you promote Suicide Prevention Awareness Month. You can download and print brochures, posters, and fact sheets to display at your workplace, at home, or in your community. You can also download and share social media images with your friends through Facebook, Instagram, and Twitter! The brochures and fact sheets are great conversation starters at work, at home, and with your friends. 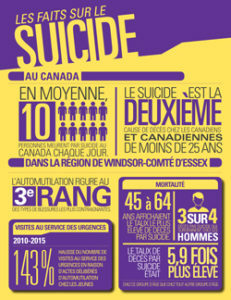 Talk about what you can do to raise awareness of suicide prevention this month and reach out to loved ones who need help. You can post these in your workplace or distribute them to your staff and clients. Talking about suicide can be intimidating. It’s also important to be sensitive to those who have suicidal thoughts. This documentation contains useful information such as appropriate language to use when reporting or writing about suicide (examples of what to do and what not to do) and tips on how to report on suicide in a thoughtful and respectful manner. 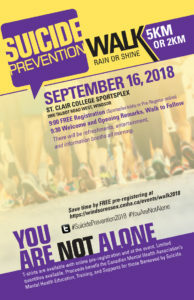 The posters promoting Suicide Prevention Awareness Month and the Walk on September 16, 2018 can also be posted around your workplace and shared with staff and clients. Invite your family, friends, and co-workersꟷ join us for the annual walk! 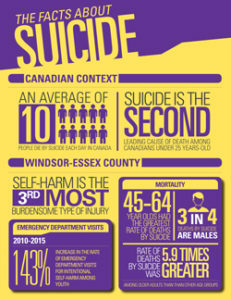 Three videos have been created for Suicide Prevention Awareness Week. Please feel view and share.